Facebook Link – Click Here. "This Bookoholics meet brings to mind words like, innovative, candid, intellectual, and refreshing. Rani Dharker’s ideas, through her books, the excerpts that she read were, stimulating, glaringly truthful, humorous and gripping. Her narration held us in rapt attention, to every word she said, and her choice of words in writing the novel often vividly painted the emotions and settings of the novel to me. The candid discussion that followed threw up many new perspectives, and was helpful at a personal level too for which I am indeed thankful to her. I must draw a attention to the wit with which she answered many questions and her quality of often engaging the entire audience in the discussion even when the question was asked by a specific person. So kudos once again to Bookoholics and to Rani maam for making it and giving us this intellectually refreshing experience and a peep into an author’s life. A special thank you also to Urvi for introducing us to mam." "When the reading session started, it was just like you have been transferred to the world of Anurima and the Parsi aunty of The Virgin Syndrome. Well, what more you can ask from the author when she has spell binded the audience in her world of literature and fantasy. Also communicating with her I never felt that I am conversing with an author of repute. It was like I am talking to my favorite aunty. Her charm and poise, the manner with which she communicated reminded you of an inspiring teacher. After interacting with her and attending the meet yesterday it was like Bookoholics have raised the standard of quality reading not only for me but I suppose for many in the group. The Bookoholics events have started creating a niche in the city. The city well know for food and business, the group has been providing impetus to the many booklovers who seek a platform for interaction and discuss books." "The author reader meet with Rani Dharker really did whet our literary appetite... She was so fluent and comfortable with what she discussed and wrote about... I loved a couple of phrases in her writing like "marinated in tradition" by which she describes the family of the narrator in "The Virgin Syndrome" and "The water dripping from the umbrella created small puddles in the water below" from Anurima... How beautifully has the essence of a scene been captured... almost like a painting... :) "
"The bookoholics meet of 23rd Sep was different from all other times combined. It was different because it was inspiring and humbling at the same time. But in one sense, it was precisely what you would expect of a high quality meet of interested readers, and a master writer. Different because it was precisely what you never would get in Surat. There are author reader meets happening often in surat, and intellectual discussions happening all the time, but not about English literature. With no disrespect to Gujarati literature, bookoholics gave readers like me, who are comfortable only reading English literature, a peek into a hitherto imagined but unseen world. The guest, the author Ms Rani Dharker was a picture of calm, poise, grace and elegance. Combine that with the humility to not get offended at idiotic questions, and a sense of humour, and she charmed all of us. To be honest, I had never attended a book reading session before, and was apprehensive about it. But it was more fun than I could have expected. Not laugh out aloud fun, more like 'aha' fun, or "I could make out what she did there" fun. I am sure she can come up with a better word than fun, but I can't. And I could see that she was a master of her craft. I am sure a lot of people realised after listening to her, how tough it is to write a good book. Mastering a language, making it dance to your tunes is a craft, not unlike painting or music. I am sure a lot of would-be writers who got a couple of 'likes' on their blog got a reality check." This was unprecedented. Bookoholics has moved forward to a whole new level with this meet. 'She' never felt like a guest. It was just like a huge family in the living room with their daily 'after-dinner' talks. It's not easy to linger on forever inside someone's mind with just a 2-4 hour talk but Rani Dharker left us aghast and 'spellbound' (Harry Potter lover The book reading reminded me of my bedtime childhood stories) with her voice so dear and comforting. I knew then what the essence of all this reading and writing is. This is one queen bee, one wonder woman. Poise. Elegance. And by the time it ended, we all knew she had given life to the little author in us. 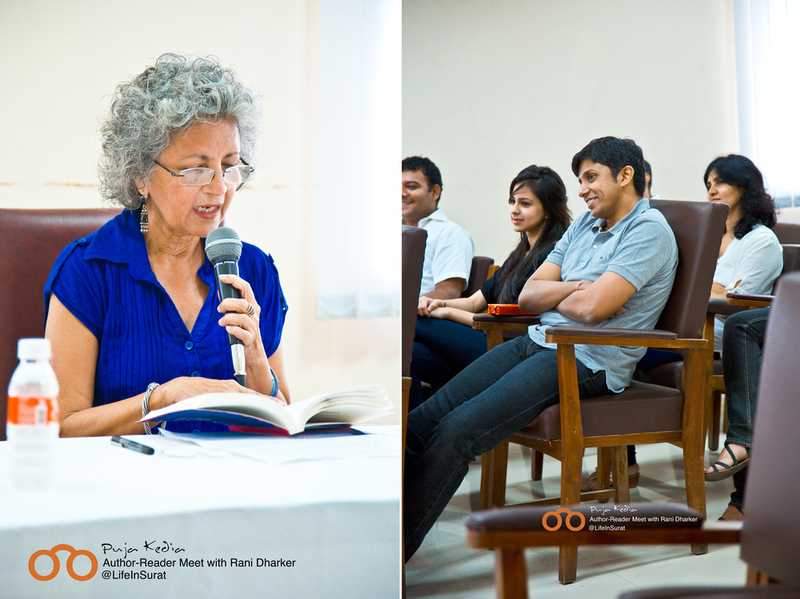 I would say we were highly blessed to have an author like Miss Rani Dharkar as our guest of honour. As the host for the day Shrey Jadav correctly proclaimed and we all second it, that there is a world in Surat which beyond khaman and locha .. A world full of books and we, the bookoholics.. Rani Maam was humourous and spontenous. It was a treat to be a part of something like this. Bookoholics was more or less an accident for me. Even though it had been around for quite a bit of time, I got to know about it, only sometime last November, when the group gave a platform to one of my friends to come forward and talk about his books. And since that day, I haven’t missed a meet. Yes, not even a single one. And I would rather consider myself happy that all of the meets that were held since then, have been exceptionally amazing, from the Popsicle party to the open mike to the introverts vs extroverts. But the one that was held this Sunday, was primordial, intriguing and the best that we have had yet. Seldom does it happen that we see Rohan Panwala sitting quietly all through the meet, and not talking, even while he was given a chance for it. Now if an event of that intensity has occurred, you would know how charismatic our speaker for the day was. Rani ji lived up to the expectations. Tender and poised, she took us through the damp pages of her books, telling the story is parts, and leaving us with a desire of getting out hands laid on them, and putting a full stop to something that she has started in our minds. She never said something exceptionally funny, nor was the meet too profound, rather it was the simplicity of the things that kept people glued to aura that was set up. And most importantly, she listened to what all we had to ask, she pondered over all of them. As Shrey rightly said, she was adorable. Period. Another attraction for the afternoon was our very own, pocket sized powerhouse. The smart lad, was confident as always, and yes, he did not forget to put in his punch lines, wherever he could. Last but not the least, kudos to the power couple of our group, Rahul and Puja, who time after time, have made sure that the meets happen, and also, if they are happening, they sure remain alive with life. Sometimes all you need on a Sunday morning, to forget the chaos of the week, is an interesting conversation (though I was just a keen listener) and that’s exactly what the last Bookoholics Meet provided. Ms. Dharker was a complete pleasure to listen to and I completely appreciated her views on everything from story telling to language to books made in to movies (though I didn’t agree with putting Vikram Seth on the same level as Arundhati Roy... Mr. Seth is fabulous!). Shrey was really sweet, one could feel the respect he had for Ms. Dharker in his voice. Pinak, a pleasure to listen to, as always. Its been almost 3 years that I moved to Surat and Bookoholics is surely one of the best things that has happened for me in this city. I had ‘met’ the warm, foodie, social, entrepreneurial Surti but Bookoholics made me see the other side of Surat. Thank you so much! Amrita at Bookoholics Author-Reader Meet. These are a few more stills from the last meet. End Of Part I. We will be continuing to document the member feedback and experience in Part II of this post. Comment below and let us know what you think about this post.